This mysterious and miraculous visionary shrub originates from the Congo basin and was spread to Cameroon and Gabon by Pygmies and Bantu. It is cultivated by a few tribes from this region who use it in their Bwiti religion. The Bwiti cult and other secret cults from West Africa use Iboga to communicate to their dead ancestors. 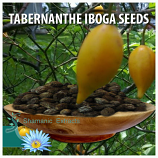 In many ways its effects and use are similar to the better known Ayahuasca from South America but the effects of the Iboga can be stronger and last much longer. Our Iboga is more expensive because its harvested after 10 years to ensure maximum strength, this is the price you pay for quality. If harvested much sooner it will be too weak to do anything. 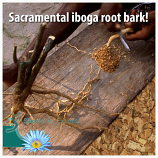 Beware of sites advertising cheap Iboga most of it has been picked too young, is whole root and even adulterated. We only sell the root bark because its over 7 times stronger than whole root (and rootpowder). Our iboga rootbark does contain up to 6% alkaloids! Our Iboga rootbark is vacuum packed and will stay fresh for a long period. We also sell grade A seeds. Our seeds are fresh picked and viable. The freshly seeds are harvested from locally grown plants. Seed is shipped in moist vacuum and will likely germinate before or in transit Unpack carefully!